Today was the first day of SMOFCon, but I had no specific commitments, so I elected to sleep in to make up for the lost sleep it cost me to fly to Boston in the first place. David Clark (with whom I'm splitting a hotel room), Linda Deneroff, and I ventured out mid-morning to find breakfast (the hotel breakfast being too expensive for us when there are reasonable alternatives). After one false start caused by reading the map the wrong way around, we went to Thornton's Restaurant a short walk from the Back Bay Hilton, where we all had good breakfasts at a fair price. Somewhere between last night and today, I seem to have lost my cold-weather stocking cap, which is annoying but not critical. 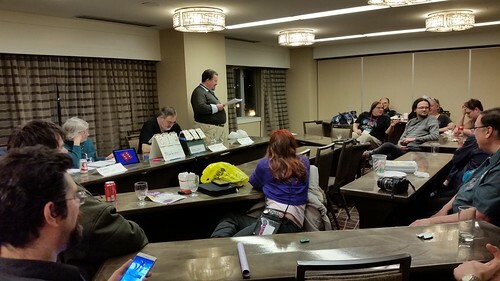 I spent a good chunk of today just hanging around talking to people, which is a major part of SMOFCon, of course. Linda (who is deputy division head of WSFS for Worldcon 76 under me) and I met with Dave McCarty, the 2018 Hugo Administrator, to discuss some of the logistics for administering the coming year's Hugo Awards. Dave and I then had a separate discussion about the Hugo Awards web site, as he is Chair of the Hugo Awards Marketing Committee (of which I'm a member) that manages the Hugo site as well as the Worldcon.org, WSFS.org, and NASFiC.org sites. It appears that we've had a glitch in e-mail handling at TheHugoAwards.org that we're working on correcting. Most of the afternoon was taken up with a Worldcon 76 general staff meeting, this being one of the places where we can get a lot of the people together. Unlike the meeting in Scottsdale, this was more of a "get as many people as we can in one place and then we can talk over things in smaller groups as needed" as opposed to the more structured meetings. A group of us went out to dinner at the Summer Shack right next door to the Hilton, at which I had some excellent crab cakes and, upon Deb Geisler's advice, the shells and cheese side dish. Well worth it. Then we came back to the hotel for the ice-breaker, which was a hilarious game where people came up with the most outlandish possible solutions for conrunning scenarios. (I won a small prize for my suggestion of the application of high explosives to one of the problems.) After that there were several possible things to do. I choose to join in to a game of If I Ran the Zoo... Con, playing with some of the new scenarios in the fourth edition, which I'd not seen before. I still think our team made the right decisions, we were unlucky in parts, and ended up not winning the game, but it was still fun. The Utah NASFiC bid and Santa Rosa SMOFCon bids jointly hosted a meet-and-greet session that I wanted to attend, but the SMOFCon game took up so much time that things were breaking up by the time I got there, so I went back down to the hospitality suite and hung around until the word came down that it was closing time. I guess I'm still closer to living on West Coast time. I'm glad I don't have any early-morning commitments on Saturday, so there's still a chance to sleep in a little bit. That's particularly important because Saturday night is first the Fannish Inquisition and after that the traditional Probability & Statistics Seminar, which I, as the tournament director, have to attend to the bitter end even if I crash out in the early rounds. Am I having a good time? Yes, definitely. SMOFCon is generally one of the high points of the year for me, and so far, this year is no exception.